Recently a reader asked about autoformers and if I had any software programs for designing them. I don't, but the math is simple enough. Autoformers are like half a transformer—the good half. Like a transformer, they reduce voltage swings and increase current swings, while maintaining a constant power transfer; and they transform low impedance to high impedance or high to low. That was the good half. Unlike a transformer, they do not isolate. If 100Vdc appears at one end, 100Vdc will appear at the other end all the taps. This is the autoformer's downside. Another project that I would love to see developed would be a para-feed power amplifier with an autoformer in place of an output transformer. Such an autoformer would be much less heavy as a comparable output transformer, as the autoformer passes more power more easily, as the current that enters the autoformer is the same current that flows into the loudspeaker. Since we are not trying to extract every last watt, we can use a complient-constant-current source (CCCS) in place o fhte choke load. No matter what the audio project, we need to know the math behind the autoformer's winding ratios. The simplest autoformer holds just a center tap at exactly 50% of the single winding, much like a center-tapped choke. The inductance and DC resistance measured from the ground tap to the center tap equals the inductance and DC resistance measured from the input tap to the center tap. As a result of this 50% division of turns of wire about the core, the output AC voltage measured from the center tap to the ground tap will be 50% of what is presented to the input tap and ground. In the example above, we see that 16Vac is applied across the entire winding and 8Vac appears from the center tap to the ground tap. Because we can only alter the form energy takes, never destroying it, the current flow available at the center tap will be twice that which is applied across the entire winding. In other words, with the exception of some core and copper losses, turning a small portion of the input power into heat, the autoformer is a constant-power device. In this example, 4W goes in at the top and 4W comes out at the center tap. The impedance ratio is equal to the winding ratio of the output tap squared. In this example, 50% equals 0.5, which squared equals 0.25, so the impedance ratio is equal to 1:0.25 or 4:1. Thus, the 8-ohm load appears four times greater at the top of the autoformer, i.e. 32 ohms. Here is the complete list of autoformer formulas. I mentioned a para-feed single-ended amplifier that held an output autoformer instead of an output transformer. Well, let's quickly design a simple headphone amplifier based on this design premise. We assume 32-ohm headphones and we wish to increase the 32 ohms by tenfold (3,200 ohms) at the end of the autoformer. The first step is to find the winding ratio of the output tap relative to the autoformer's entire single winding. We plug the two impedances into the formula for finding the tap ratio and we get 0.1 or 10%. To make such an autoformer we could simply wind one layer on a coil form and take the tap output at the end of the single winding; then, we would continue laying down nine layers of windings. If the inductance proved insufficient, we might have to lay down 20 layers and take the output tap at the end of the second layer. In addition, much will depend on the core material used. Which output tube should we use? Well, working on the 2rp rule, wherein the the plate load should equal twice the output tube's plate resistance, we would need a 1600-ohm rp output triode. A 6BL7 triode or a triode-connected 807 would work. But I would use two 6DJ8 triodes in parallel instead. Why? They could run on a lower B+ voltage and the two in parallel would offer much greater transconductance, about 20mA/V; In addition, at 10mA of current flow, the 6DJ8's plate resistance is close to 3200 ohms. Note that each 6DJ8 triode gets its own cathode resistor and bypass capacitor. Each triode idles at 10mA, which combined equals 20mA, which is the peak symmetrical output current swing at the parallel plates into a load impedance of zero ohms. The peak asymmetrical current swing down is more. With a load of 3,200 ohms, the peak current swing is equal to B+/(Rload + rp) or 100V/(3200 + 1500 or 21.3mA. Since the autoformer's winding ratio is 10, the current ratio equals 10. In other words, the output tap will see +/-200mA current swings, which, against the 32-ohm headphone, will result in 6.4Vpk of peak voltage swing, which in turn equals 640mW. How much inductance is required? With a Zin of 3,200 ohms, my quick calculation reveals that at least 25H are needed, as measured from one end of the autoformer to the other end. The high-voltage PNP transistor monitors the current flow through the triode via resistor Ra and the transistor strives to maintain a fixed current flow through the triode. The constant-current source loading sets the idle current through both the triode and the transistor. The result is the the triode's relatively weak transconductance becomes supercharged by the PNP transistor. This variation allows us the most voltage for the constant-current source. On the other hand, if big output voltages are not needed, we could use this variation. Note how the NPN transistor gets its own B+ voltage of 12.6Vdc, which can also be used to power the triode's heater element. Note the lower bipolar power supply voltages of only +/-6.3Vdc and the lower B+ voltage for the triode and its cathode voltage. Okay, now that we are warmed up, let's move on to the super-triode SRPP circuit from the last post. This is not your father's SRPP. There so much going here that I will only point a few highlights; for example, a negative feedback loop sets a fixed (lower) gain and lower output impedance and distortion figure; the B+ voltage relatively low, being only 100Vdc; and the NPN and PNP transistors do the heavy lifting. There is a lot to like here, but my original goal was a far lower B+ voltage. Just the other day, the solution came to mind: a super-triode, horizontal SRPP amplifier. I have argued here before that when trying to understand the SRPP workings, it is best to pretty much ignore the bottom triode and focus on the top triode, which is effectively a simple impedance multiplier circuit (IMC), which make the external load appear twice as large in resistance than it actually is, so that the two triodes can deliver twice the idle current into the load impedance. Well, what if move even further in the impedance multiplication, so much so that we can replace the first 100mA constant-current source (CCS) with a 3mA CCS. Note the 3mA and 200mA constant-current sources and the 200-ohm current sense resistor, not a 5-ohm resistor. The impedance multiplier circuit makes a low headphone impedance appear vastly larger to the input stage, which explains why the 300µF internal coupling capacitor was replaced by a mere 47µF capacitor. Three topologies rely on a current sense resistor to generate the needed anti-phase signal to drive the slave triode in a push-pull fashion. I label this group of three The Lazy Push-Pull Stages. The SRPP is one of the three. The other two are the White cathode follower and the SRCFPP. In the White cathode follower, the sense resistor is moved up to the top of the circuit, where it reveals the current variation through the top triode. . In SPICE simulations, this circuit worked quite well. Here is the SPICE-generated Fourier graph. The THD comes in at below 0.1% and the harmonic structure is quite single-ended in appearance. Much like most SRPP circuits, the PSRR is weak, but the output impedance is lower, coming in at a little less than 500 ohms. Still, I wasn't pleased enough by this version, so I tried the next one. Note that I had to increase the rail voltages to +/-108Vdc to get the idle current up to the previous version's. Here is the Fourier graph. My next move was to add a capacitor bypass to the two emitter resistors. In SPICE simulations, the THD dropped, but the higher harmonics went up. Which version would sound best? Hard to say. This last version sports a 40-ohm output impedance, which will make some headphones sound better; others, worse. The last of the three The Lazy Push-Pull Stages is the SRCFPP. The current-sense resistor is located at the bottom triode's cathode and ground. If more current flows through this resistor, the bottom triode decreases its current conduction, as it effectively sees a more negative grid voltage relative to its cathode. Conversely, if the resistor sees less current flow, the bottom triode increases its current conduction. 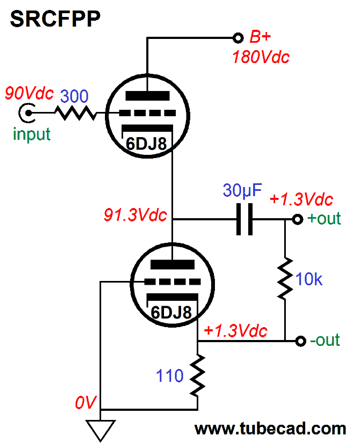 Making this circuit a super-triode circuit requires adding two PNP transistors. The transistors will strive to maintain a constant current flow through the triodes. Let's now flesh out the design with some part values. Yes, there is a lot more now. I added the MUR410G rectifiers and resistors R1 & R2, which allows us to perform an Aikido-mojo PSRR enhancement. In SPICE simulations of this circuit, the balance between top and bottom sections was excellent. Here is the graph of the transistor current swings. The bottom is a tad weaker than the top, but 2.8-ohms was too much. Yes, it is that tweaky. In fact, this circuit scares me, as the MUR410G rectifiers exhibit a very low series resistance and the only thing that keeps the transistors from running away with themselves are the two 2.7-ohm resistors. But at the same time, we get some fine performance. Here is the SPICE-generated Fourier graph fro 1Vpk into 32-ohms at 1kHz. The THD approaches 0.01% and the output impedance is crazy low, as in 1 ohm. If the signal source is a DAC or any other power-supply-noise-free signal source and if resistor R1's value is 100k and R2's is 1.8k, the PSRR is a superb -60dB. Note that a standard three-connector headphone jack cannot be used with this super buffer, as each channel's output is balanced. 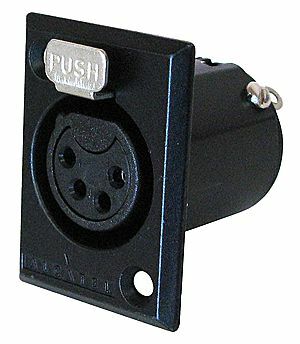 Thus, a four-pin jack must be used. Okay, I admit it: I love piano music. One reason is that I can listen to it and do other things at the same time, such as writing, reading, sketching circuits, putting together kits. Vocal and big orchestral music, in contrast, demands too much attention. Because I do so love piano music, I am always on the search for more of it. While listening to a Tim Ferriss podcast, wherein he interviews Scott Belsky, I heard Belsky mention Carly Comando's piano music, which he used to reward himself when he needed to dangle a carrot in front of himself. I found Scot to be bright and sagacious, so I searched for her music on Tidal. Happily, Tidal offers two albums and several singles from her. I preferred her One Take album, but it is not as well recorded as her Dreamlife album. If you like Max Richter, then you will probably like Carly Comando. Be sure to check out her piece Everyday on a grand piano. I discovered Tigran Hamasyan, the Armenian-born American jazz pianist, a few years ago and rediscovered him recently. His compositions straddle jazz and classical music—with a dash of New-Age whimsy thrown in. Tidal offers at least eight of his albums (with Tidal, you can never be sure what's hidden), three of them in MQA. Give his An Ancient Observer albums a listen. Although certainly piano centric, it's not a solo piano recording, as voices and other instrument appear throughout. His Luys i Luso (Light from the Light) album definitely falls into the classical category. It is an ECM recording of his explorations of Armenian sacred music and it should be on your short list of music to check out. By the way, Enrique Grandos claimed to have composed all 12 pieces when he was just 16. He was certainly a child prodigy. Born in Spain in 1867, he later studied music in France with fellow student Maurice Ravel. If you have been reading my posts, you know that my lifetime goal is reaching post number one thousand. I have 561 more to go. My second goal is to gather 1,000 patrons. I have 933 patrons to go. Help me get there.